America Singer has made it into the Elite–the last six girls left competing to marry Prince Maxon. She is determined to compete for real now, yet her feelings are still torn between Maxon and her ex-boyfriend Aspen, the man she had always envisioned spending her life with. She constantly questions her decisions and the motives for her actions, but as the contest gets more serious, so does the situation with the rebels. The castle is repeatedly under attack and suddenly there is more for America to decide about her future than simply who she will marry. I cannot tell you how excited I was to read this book!! The Selection was one of my favorite books of 2012 so I literally downloaded The Elite to my Nook at midnight the day it was released. The Selection was the type of book I absolutely could not put down, and The Elite was exactly the same. In this book, America has decided to take the competition more seriously now that she knows Maxon a little bit better and wants to give him a fair shot. Since they are down to the final six girls, the competition gets increasingly difficult for all of the girls, not only physically but emotionally as well. While America grows closer to some of the girls and honestly likes most of them, she is forced to realize that they are ultimately her competition and if she really wants to win The Selection, she will have to be better than them all. The only problem I had with this book was the fact that America went back and forth a lot between Maxon and Aspen. I understand that she was emotionally torn between the two of them, but it bothered me a bit that she had to constantly lead both of them on. She kept telling herself that she needed to decide between them, yet going back and forth just made the situation worse for them all. What also annoyed me about her is that she kept getting jealous of Maxon taking the other girls on dates, yet she was secretly sneaking around with Aspen! Aside from this however, the book was fantastic. I really liked that the political situation escalated in this book. We got a better understanding of the type of society America lives in and how it evolved to be that society. I think America herself also began to look at herself in relation to the rebellion going on in the country and how it affects not only her but people of all castes. Overall, The Elite is an excellent sequel to The Selection. It kept me on the edge of my seat and I was unable to put it down until I had finished it. While some of America’s choices annoyed me, I liked where she ended up by the end of the novel and I am excited to see where the third book will take her. Team Maxon all the way!! 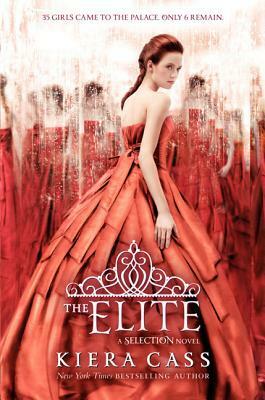 The Elite was released on April 23, 2013 and is the second book in The Selection trilogy. The final book, The One, is set to be released on May 6, 2014.